This ESG Lab report documents hands-on validation and performance auditing of Veritas Virtual Appliances. The report focuses on deployment of the appliance into existing virtual infrastructure, which is easy and flexible while still delivering the performance required to meet today’s modern data protection workload challenges. 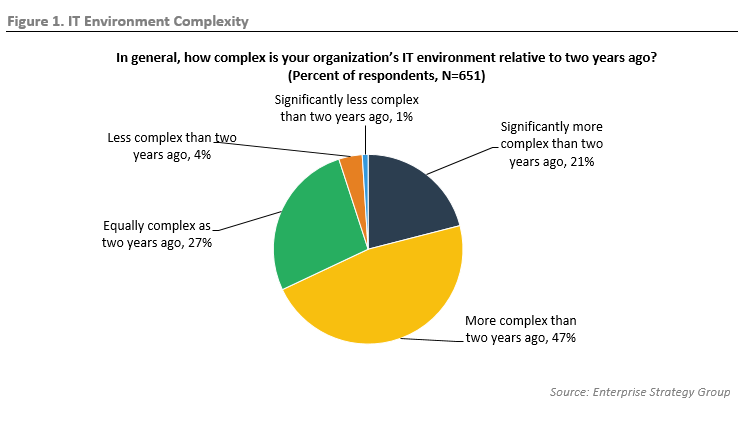 According to recent ESG research, 95% of respondents report that complexity inside their IT environment is either more complex than or equally as complex as it was two years ago. Only 5% think complexity has gone down (see Figure 1).1 This is largely due to an increase in the amount of data, applications, and devices that need to be managed. In spite of the fact that data protection is a longstanding IT discipline, it is not immune to this IT complexity sentiment. In fact, when the amount of production data, applications, and devices increases, so does the demand on the data protection environment. To compound the challenges for the data protection professional, the data, applications, and devices that need protection now live not only in the corporate data center, but also on the edges in remote offices and branch offices (ROBOs), in the cloud, and often in multiple clouds. Veritas Virtual Appliances are purpose-built, fully integrated, enterprise-class data protection appliances designed to help customers address today’s data center challenges by simplifying data protection deployment and management. The virtual appliances are deployed as VMs into existing virtual infrastructure from Veritas prepackaged OVA templates. Figure 2 shows how the appliances are deployed. The left side of Figure 2 shows the appliance deployed as a Master/Media combination in a ROBO environment. The right side of the figure shows the master, data center, and NetBackup CloudCatalyst virtual appliances in a primary data center. It should be noted that the Veritas family of virtual appliances runs the same code as the industry standard physical appliances from Veritas. In fact, virtual deployments were used by Veritas for development long before it was ever packaged and released for customer use. It leverages the same intelligent end-to-end deduplication that extends into the public cloud and has the same features found in both physical appliance and standard NetBackup deployments. Simplified deployment: The software-only solution combines protection software, virtual machine, operating system, and networking resources in a single converged platform that’s easy to deploy without expert onsite services or additional infrastructure. To deploy the virtual appliance, organizations simply download the OVA template to an existing VMware ESX Server and click deploy from a template option. Upgrade and scale: Organizations can easily expand or refresh existing NetBackup environments. The Master/Media Server and Media Server-only configurations allow the solution to be scaled from .5 TB to 250 TB depending on capacity feature requirements. Optimized data protection: Veritas source-side data deduplication for servers and applications helps improves network resource utilization by reducing traffic by up to 99%. ESG performed hands-on evaluation of the NetBackup Virtual Appliances from our corporate office in Milford, MA by leveraging a remote Veritas demo environment. We conducted a review of the platform’s architecture, navigated the simple deployment process, and audited performance testing results. 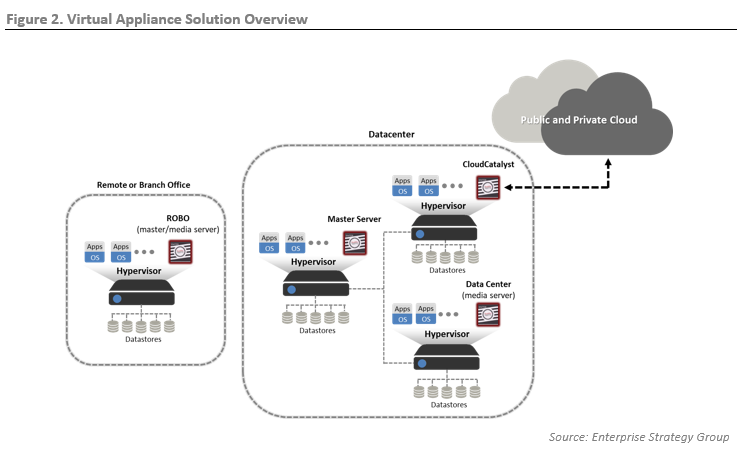 ESG began its validation of the Veritas Virtual Appliance with an exploration of its architecture and software components. As shown in Figure 3, virtual appliances are deployed into an existing virtual infrastructure as a VM. The virtual appliance resource requirements such as vCPU, memory, and storage configuration are documented in the guidelines section of the Veritas Virtual Appliance support documentation. 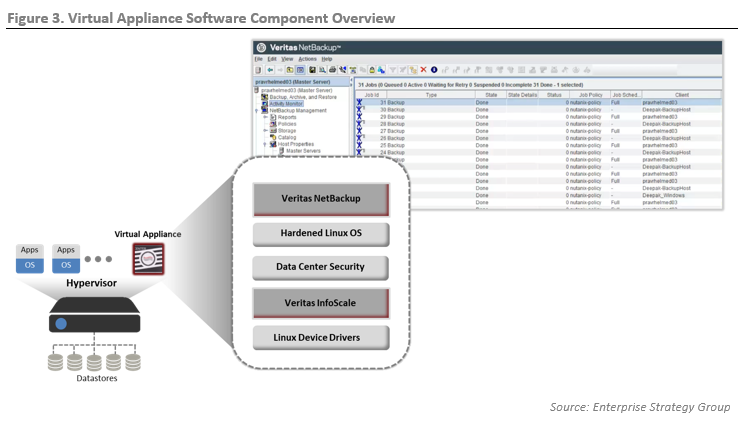 As shown in Figure 3, The virtual appliances use the same Veritas Operating System (VxOS) components found in the field-proven physical appliances. Protection application: NetBackup is a unified data protection solution for any size business with enterprise-class scale, performance, and extensive workload integrations. It's designed to protect the largest and most complex heterogeneous environments including cloud, virtual, and physical applications, servers, and storage devices. Operating system: Red Hat Enterprise Linux (RHEL) is an enterprise-class distribution of Linux that is curated, secured, and supported by Red Hat. Red Hat is one of the leading contributors to the Linux kernel and associated technologies in the greater open source community. RHEL supports and powers software and technology for automation, cloud, containers, middleware, storage, application development, virtualization, and more. Security: Symantec Data Center Security: Server is a security solution that delivers threat protection with agentless anti-malware, network-based IPS, and file reputation services for VMware environments. It supports in-guest quarantine features to isolate suspected malware files and remediate based on policy. Storage management: Veritas InfoScale is a storage management software package that includes Veritas File System (VxFS) and Veritas Volume Manager (VxVM). It delivers a comprehensive solution for heterogeneous online storage management while increasing storage utilization and enhancing storage I/O path availability and performance. 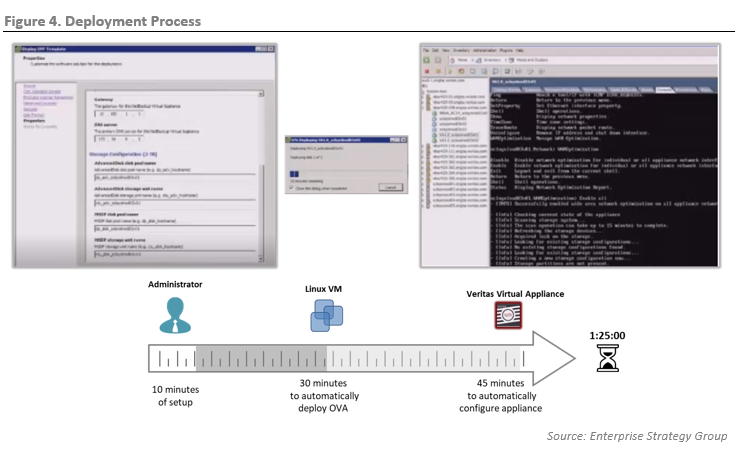 Next, ESG walked through the entire virtual appliance deployment process. As shown in Figure 4, there are two major phases to the process. The first phase is to configure and deploy, with the correct system resources, the VM that hosts the virtual appliance. The second phase is to configure the virtual appliance software components including NetBackup. For this report, we documented the deployment of a 2TB Master/Media Server ROBO configuration. To start the deployment, we first downloaded the ROBO version of the OVA packaged Veritas Virtual Appliance software to test the VMware environment. We then logged into the vSphere Client and used the OVA template wizard to guide us through the VM configuration. As shown on the left side of Figure 4, the wizard walked us through each step of the configuration. We were able to assign a name to the VM, select the cluster host and datastore to deploy on, and step through a standard network configuration. The wizard also allowed us to define a storage configuration to be used for NetBackup pools during that phase of the process. It took approximately 30 minutes to initialize the VM. Next, we moved to the second phase of the configuration process. This phase of the process is automatically launched by a configuration script on the first boot of the VM. The script then automatically configures all the NetBackup components of the virtual appliance, including the disk pools and storage units. Phase two was fully automated and took approximately 45 minutes. It should be noted that the entire process required only about ten minutes of administrator interaction. Finally, ESG audited the results of extensive performance testing for both a Veritas Virtual Media Server appliance and a physical Veritas 5230 Media Server appliance. Testing was designed to demonstrate the throughput capabilities of similar virtual and physical appliance configurations. The same Master Server and NetBackup clients were used in each test run for both platforms. Data generation tools were run on each client to simulate different backup workloads. As shown in Figure 5, backup streams were increased for each environment until maximum throughput was reached. We also used different deduplication rates of 0%, 50%, 80%, and 98%. Figure 5 shows the effect of minimum and maximum deduplication rates during throughput performance testing. The maximum observed throughput for the virtual appliance during performance testing was approximately 2.1 GB/sec at 32 backup streams with a deduplication rate of 98%. The maximum observed throughput for the virtual appliance during performance testing was approximately 2.8 GB/sec at 48 backup streams with a deduplication rate of 98%. The virtual appliance reached its maximum throughput when the solution hit network limits. The physical appliance reached its maximum throughput when the solution hit processing limits. In both cases, the appliance software components and OS stack enabled us to drive more throughput for each solution until system resource limits were exceeded. The innovation that’s been driving the latest round of IT transformation does not always make tasks easier for the IT professional. In fact, it can sometimes be very disruptive, similar to how a new cooktop purchased for energy efficiency benefits turns out to require new cabinets, countertops, and electric to work in your existing kitchen. ESG confirmed that the Veritas NetBackup Virtual Appliances are truly designed to easily fit into and protect existing virtual environments. The template packaged deployments leverage resources familiar to virtual system administrators, and the different deployment options (Master Server, Master/Media, Media Server, and CloudCatalyst) allow data protection administrators to better match performance to the virtual workloads that need protection. The physical NetBackup 5240 appliance that can be deployed as a Master and/or Media Server. The physical NetBackup 5340 appliances designed for highly scalable Media Server-only deployments. The physical NetBackup CloudCatalyst 5240 designed to efficiently extend data protection capacity to the cloud. The physical Veritas Access 3340 storage appliance that can be leveraged for long-term data retention. The physical Veritas Flex Appliance for fast deployment and consolidation of data protection solutions. ESG has been following the evolution of the appliance portfolio from Veritas for some time. In fact, we first validated the NetBackup 5230 appliance for ease of use and deployment back in 2013 when NetBackup was still part of Symantec. Since then, Veritas has continued to expand its appliance offerings with the goal of making data protection more reliable, more efficient, easier to deploy, and easier to manage for its customers. It’s also worth noting that these virtual appliances run the same code as the industry-recognized physical appliances from Veritas. In fact, virtual deployments were used by Veritas for development long before it was ever packaged and released for customer use. ESG confirmed that deploying a Veritas Virtual Appliance is quite easy. With a little preplanning (network and storage), it took us about one hour and 25 minutes to complete the entire process for a 2TB Master/Media configuration. Over 90% of the deployment was fully automated. We only spent about ten minutes interacting with the configuration wizard. We were also impressed with the performance the virtual Media Server was able to deliver. Of course, your performance will vary, and it depends on having the right vCPU, memory, and disk layout in your existing virtual environment. ESG believes that the Veritas Virtual Appliances are a great addition to the Veritas appliance family, especially for environments that are 100% virtualized. We believe that if Veritas keeps its licensing options flexible, there is an endless number of deployment possibilities—perhaps even a bare-metal boot option for customers who want the same type of hardware flexibility in their physical appliance deployments that they get with the virtual versions.